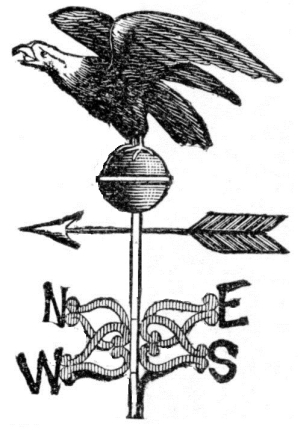 Vintage advertising image for an eagle weather vane. The vanes were made of copper and could be ordered with a pure gold gilding. The company boasted of having an illustrated catalogue of over 250 designs and could make a vane from any design. This weather vane has an American bald eagle with out-stretched wings perched upon a globe, with and arrow pointing the direction of the wind and north, east, west and south indicators. I’m thinking the top half with the bald eagle and arrow could make for a nice illustration too. This vintage illustration was one of many home-related drawings found in the 1887 Scientific American Architects and Builders Edition.